establish his bona fides in the upper tier of Saucerdom. He had already jumped the gun and collected his channeled messages into the misleadingly-titled I Rode A Flying Saucer in 1952. His pleasant hypnagogia was shortly interrupted by the shadowy figure of a man standing at the foot of his sleeping bag who announced, “I am Solganda, and I would be pleased to show you my craft.” Van Tassel wrote that he was led to a hovering UFO and stepped into what he described as a “butter colored” light emanating from the underside of the craft. He was taken on a tour of the ship and told that he had been chosen to bring a message of peace and interplanetary brotherhood to his fellow earthlings. Thus anointed, Van Tassel began publishing The Proceedings Of The College Of Universal Wisdom (as he dubbed his new venture), a semi-regular newsletter sent out to the faithful; in return, they began to send in donations for a device that Solganda and his pals had instructed him to build on his property in the high desert. 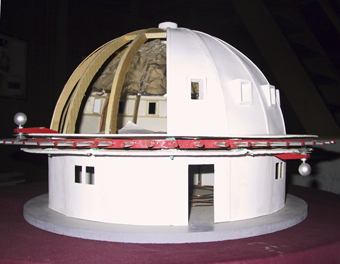 Looking more like an insane astronomical observatory than a machine, it was never completed. It was supposed to enable humans to live well past the expected lifespan and give us a chance to evolve spiritually in this lifetime—without all that pesky reincarnation stuff. In spite of some differences between his stories about the Space Brothers and those of his contactee contemporaries, Van Tassel never attempted to contradict his compatriots, and went so far as to feature many of them at yearly conclaves. The Giant Rock Interplanetary Conventions were held annually from 1953 to 1977 and attracted thousands of attendees, who camped out for a weekend listening to the latest messages from the galactic best-seller list. Tennessee contactee Buck Nelson even sold swatches of "Venusian Dog Hair" at some of the meetings, and myriad other hucksters vied for the hard-earned dollars of the saucer nuts in those glorious days. Giant Rock still sits as a monument to the era, a 2.5-mile drive north of the Integratron on a soft, sandy road. In 1999, about one-fifth of the rock split off, revealing a snow-white interior. Variously interpreted as a good or bad omen by local new-age groups, it was likely the result of more than 30 years of repeated bonfires that expanded the rock near a weak point. It was almost immediately covered in graffiti and stains from fires. Van (as his friends called him) produced a second volume, The Council Of Seven Lights, in 1958. The introduction was succinct: “The information in this book is the result of a developed ability to awaken the nearly dormant consciousness to thoughts existing throughout time. Nothing can be thought of that has not been thought of before... All of the principles of everything that can ever be already exist in the infinity of Universal Mind.” In a way, these musings were borne out by revelations of the US Army's remote viewing unit, which used “psychic spying” to gather intelligence on the Soviets, find lost planes and kidnapped officials, and probe the depths of space and time. His widow was left with taxes and bills for upkeep that she couldn’t possibly cover, and she sold the Integratron to a San Diego developer who announced plans to turn it into a disco. Realization that no one would want to go to a disco in the middle of the desert was probably the main reason it was then sold to a group of Van Tassel supporters, who locked the gates until 1987. This didn’t stop shadowy burglars from taking most of Van Tassel’s remaining electrical equipment, notes, and records before Emille Canning took possession, attempted some restoration and led tours of the property. Faced with increasingly diminishing returns, he in turn sold it to two sisters, Nancy and Joanne Karl in 2000. The two east coast transplants now live on the property and have begun extensive restoration work on the deteriorating Integratron. “We used to come out here and sneak into the Integratron when we were in college. We always loved the place, but had no idea we would eventually end up owning it,” says Joanne. They have started a website and now give regular tours. “We try to follow in the spirit of George Van Tassel, which makes it difficult to buy paint and other things we need, since we can’t use anything with metal in it.” Any wealthy potential patrons are encouraged to contact the Karl sisters through their website, www.integratron.com. An application for tax-exempt status is in the works. For now, the Integratron enjoys patient and loving care. With luck and a large chunk of change, the goal is to get the thing completely restored and working, as Van Tassel envisioned. Some nighttime photos taken recently at the site produced the ubiquitous “orbs” that seem to be the rage in spirit photography. The anomalies only made an appearance in one frame, and were not due to anything on the lens or in the air. 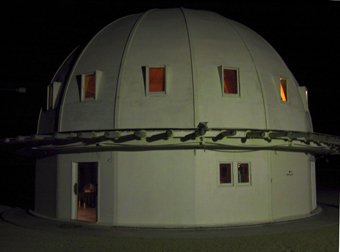 The Integratron is entered through a small door, opening to a lower level which features exhibits on the history of the area, the Giant Rock Conventions, and Van Tassel himself. A small but intricate model of the completed building has survived and shows the innards in detail. Visitors are invited to stay and browse an extensive library, but the freedom of this arrangement has caused a few patrons to make off with some of most choice titles, which can fetch a good price on eBay. Reprints of The Proceedings of the College of Universal Wisdom line part of the shelf. Like many examples of channeled literature, there is a very high signal-to-noise ratio, and only the patient or obsessed will be able to glean universal truths from this offering. As a glimpse into another era and one man’s mind however, they are invaluable. A sturdy and very steep staircase leads to the upper floor. The parabolic dome rises some 20 feet overhead, capped by a massive concrete ring which holds the supporting ribs together. The acoustics in the room are nearly perfect. Stand under the center of the dome, and sounds appear to come from everywhere. A whisper can be heard at any place in the room. This unique property inspired the owners to offer “sound baths,” which consist of a series of haunting tones coaxed from an array of glass bowls, specifically designed for the purpose. The patron sits suspended from the top of the dome in a comfortable hanging chair. The Karl sisters report that the auditory therapy has many adherents and verifiable benefits. A short demonstration of the bowls is certainly a meditative experience. Left alone for an hour in the Integratron, I sat down in the center of the floor and experienced something very strange. It was surprisingly easy achieve a meditative state: it actually became difficult to keep up the mental noise that generally crowds the consciousness.